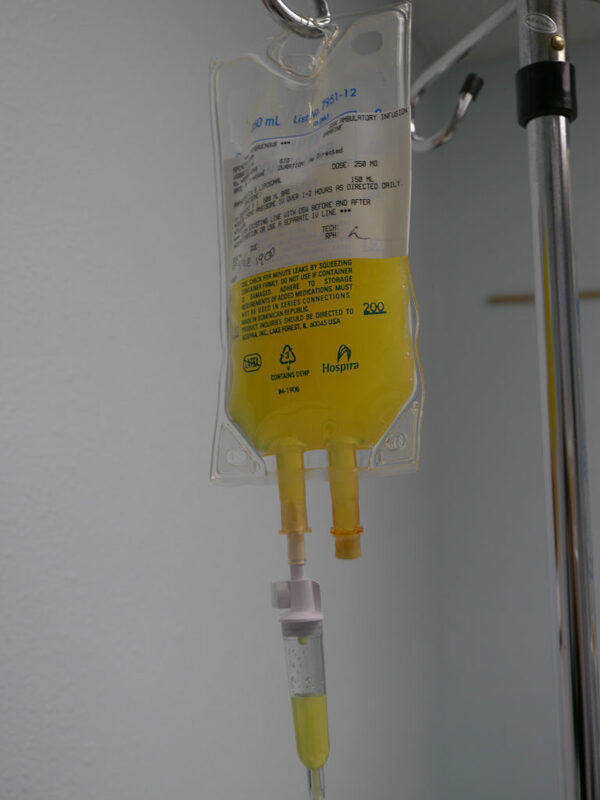 In order to treat my Leishmaniasis Brazilienses parasite, I had to begin a 21 day, daily, infusion of a toxic anti-protozoal anti-fungal medicine called Ambisome. The day after I got the official results from the CDC I went in to the hospital to get a PICC line inserted into my arm so I could get the medicine pumped into my body and rapidly diffused by my heart. I didn’t know that the process would be so involving: I had to get surgery to put the PICC line in! I was quite surprised when I went into the hospital and they told me to take off all my clothes and put on the patient’s gown. A nurse came in and spent an hour sterilizing the room and her operating area, then began sliding a purple tube through my veins. It reminded me of trying to guide a bent hanger wire through a crack in the window to get the keys off of the front seat. She checked her progress with an ultrasound. Her ultimate goal was to snake the tube into the opening of my heart, so that when I am injected with the toxic chemical, it goes through the heart and immediately disperses throughout the body and does not spend time concentrated in any one area. She once took the wrong fork in the crossroads between going down to the ventricle and up into the jugular. I felt the pressure in my neck. She gave me Novocane but the pressure still hurt. My arm had also been bent flat for three hours without moving, and then I felt the bizarre sensation of pressure inside my veins. It is not pain, but uncomfortable awareness. A chest X-ray verified the PICC line was placed in the right spot. A game of Frisbee ten days later kinked the line and it had to be pulled out anyway. In the interim the PICC line had really limited my activity, and I could feel the pressure of the extra wiring with each heartbeat. To receive the medicine I went to the Ambulatory Infusion Center. Each day I would check in as a patient, take the drugs, and head home. The treatment took 4 hours every day, starting with an injection of Benadryl to prevent any allergic reaction to the toxins and that would put me out. Then they would rinse the PICC line with a saline solution and pump in another liter to hydrate me. After I hydrated, they pumped in the Ambisome over a period of two hours to not overload my system. We got it down to 3 hours total by the end, pumping the Ambizome faster, but some days I needed a potassium or calcium supplement and it would take longer. After the random Frisbee game it took us 5 hours to figure out the PICC line was kinked, so they had to remove it and give me an IV injection every day. 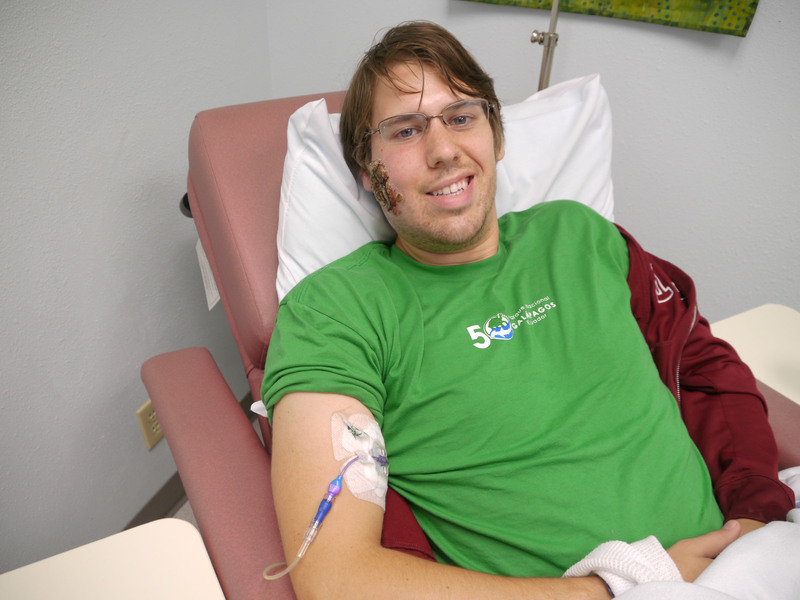 The nurses were great and I got a lot of reading, computer work, naps, and watched a few movies while getting a toxic anti-protozoal drug sent through me. I couldn’t drink alcohol at all since my creatinin levels, which measure remnants of what your kidneys don’t filter, tripled. I could have permanent kidney damage. 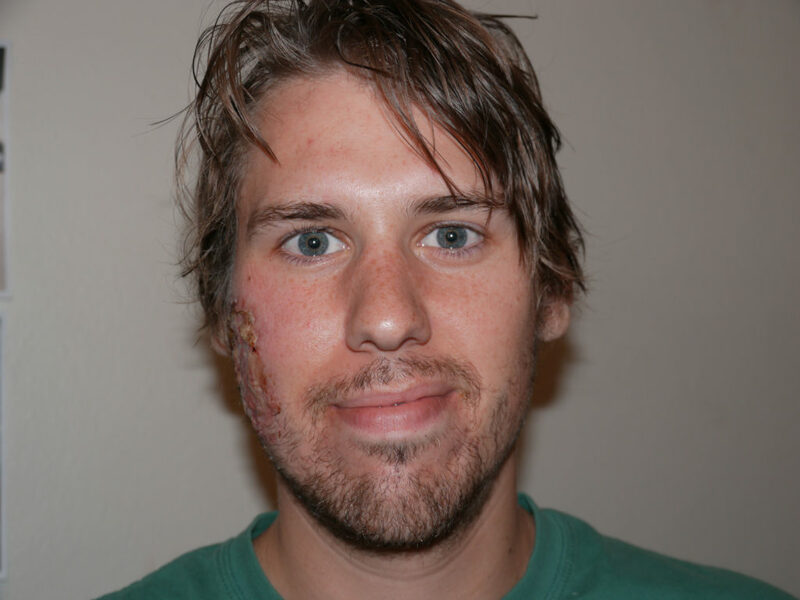 Within 5 days the swelling of my baseball-sized face decreased dramatically. Even better, my throat had pretty much healed already! And having the treatments made me feel progress. Life was moving again and it wasn’t all about Leishlie. Shalynn came with me for the first week of treatment, but soon I was using bringing my own Benadryl so I could stay awake and get some things done. By the end of the treatment I rode my bike to the hospital. Other than my kidneys testing poorly, I was not affected by the side effects. Since the parasite was on the retreat, I started covering the wound again. The thick, black scab sloughed off. I began a wound care treatment that involved an ultrasonic misting; the agitating frequencies stimulated blood flow, thereby bringing in nutrients and fresh immunological aid to the lesion. The three weeks of the treatment drudged on, but with earlier appointments I had the whole afternoon and evening to celebrate a rejuvenated passion for life. I was finally on the road to beat Leishlie! I could get on with my life! 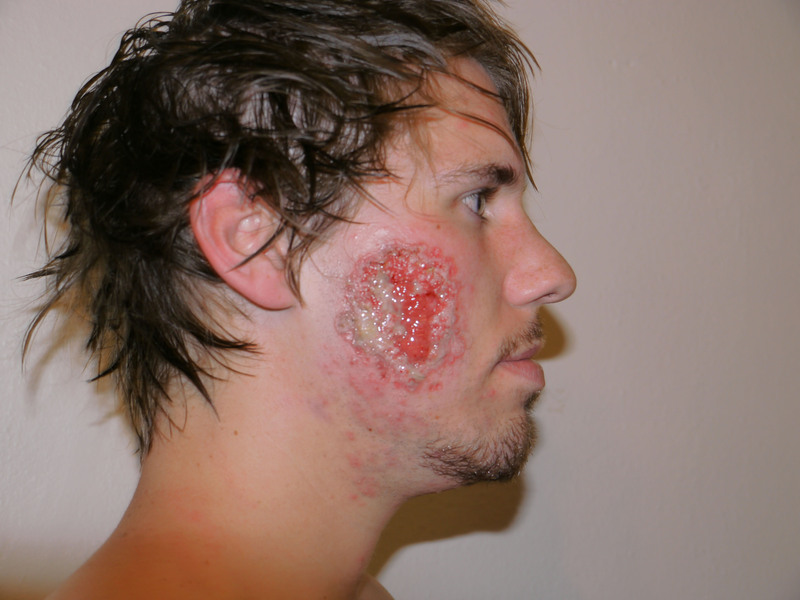 ← LeishMan 9: Leishmaniasis: an unpleasant guest.